Today I’m going to give you a list of my favorite websites that you can use to help you learn Spanish via watching television in Spanish (news, shows, telenovelas, whatever), almost all of which are entirely free. I’ve divided it up alphabetically by country. This list is mainly intended for people learning Spanish, which I think is wonderful since it’s how I learned Spanish and what I recommend others do as well. Here we go…oh, and if any of these links are dead or you know of a site that I left off please leave a comment and let me know, I’ll fix it, I promise – which reminds me, I just want you to know that I actually checked each one of the sites below to make sure that they were working and actually had streaming video available, unlike every other list of Spanish language TV/radio station sites I’ve managed to find online (all of them had links to broken sites, all of them). Additionally, if you have a particular Spanish TV show you’d like to recommend, definitely tell us! If this is you, check out Yabla for Spanish videos with Spanish subtitles and so much more. This is a fantastic website and my top recommendation if you’re looking for Spanish videos to learn Spanish with. I emphasize the last part because that’s specifically and solely what this site is designed for, and it’s the only one on this list that is solely intended for that purpose. What they do is take Spanish-language media that was originally produced in Spanish-speaking countries and intended for native speakers (TV shows, movies, news casts, cartoons, documentaries, etc.) and then integrate them into a whole Spanish-learning interface they have that allows you to see word-for-word Spanish subtitles and their English translation at the same time (you can turn either or both off while watching the video), plus you can click on any word in the subtitles and it will automatically pull up the definition in the dictionary next to the video player as well as add that word to your flashcards for later review. They also include a vocabulary learning game, quizzes, and a flashcard system that’s very easy to use and all on the same page as the video you’re watching. Ok, let’s get started. I’ve sorted the list of Spanish TV channels below by country and included short bits of pertinent information where appropriate. 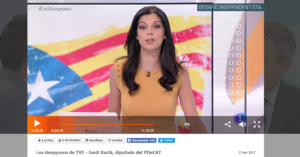 RTVE (tons of videos, the news includes a transcript that usually shows up about 24 hours after it’s published on the site). I use this site more than any other to watch television in Spanish, personally: please see my post about RTVE here for more information and show recommendations. BBC’s Spanish Language TV Section – Just awesome, includes Spanish programs from the BBC with downloadable transcripts (!!) as well as Spanish language news and TV shows, absolutely worth checking out. Netflix, Amazon Prime Video, and Hulu. I’m grouping them all together because…well, they’re pretty much all the same thing (type of service), aren’t they? Anymore, for me, Netflix, YouTube, and RTVE are where I’m getting all my Spanish-language content (and a bit on Instagram, too). Spanish-speaking YouTubers who are excellent for intermediate Spanish practice (not lessons, intended for native speakers, great for improving listening comprehension). YouTube Channels that Teach Spanish. Each of these lists includes a sample video from each channel that I believe illustrates what they’re about as well as a short description of the channel, this way you can decide whether or not you’re interested without having to click a link to each channel (as you would if I just had a list of links here, which is what this used to be). I can’t possibly list every single Spanish-language music video that includes the lyrics, but I will give you some examples and then show you how you can obtain the lyrics for nearly any other one that you want even if the video doesn’t include them. Also, there’s at least one YouTube channel devoted to publishing Spanish-language videos with their lyrics contained therein expressly for people learning Spanish, I wouldn’t be surprised if there are more (tell us in the comments if you know of others). This list was already really long with just sites that had streaming TV (a lot of them also have streaming radio, by the way), I didn’t want to make it any longer or prolong publishing it any more by trying to put together an inevitably equally long list of Spanish-language radio stations’ sites, so I’ve cheated a bit and just put links to other people’s lists of such sites where you can listen to Spanish-language radio below. Again, I can’t vouch for how many of the links on the below listed sites actually work, but most of them should be good-to-go at the very least. wwiTV.com – Biggest compilation I’ve seen yet, truly impressive. …and you haven’t already checked out my list of sites where you can watch Spanish videos with Spanish subtitles or transcripts, I highly recommend you do so because having the Spanish that’s spoken on-screen written down for you (either in the form of subtitles or an attached transcript) will help you enormously when it comes to learning that Spanish. Why? Because how else are you going to be able to look up what you don’t know? When you hear a word or a phrase you don’t understand, unless you’re a fairly advanced student you’re not going to be able to write it out and if you can’t do that then you can’t look it up. Having an English translation is just having a clue as to what was actually said, it doesn’t explicitly tell you and therefore is nowhere near as good. I keep these lists separate for that exact reason: because having Spanish subtitles is so important. Obviously, if you don’t have them that’s still far better than nothing (or maybe you’re advanced enough that you don’t need them), but I just wanted you all to be aware of this. This is the list of video sources that generally don’t offer Spanish subtitles (Yabla is an exception). 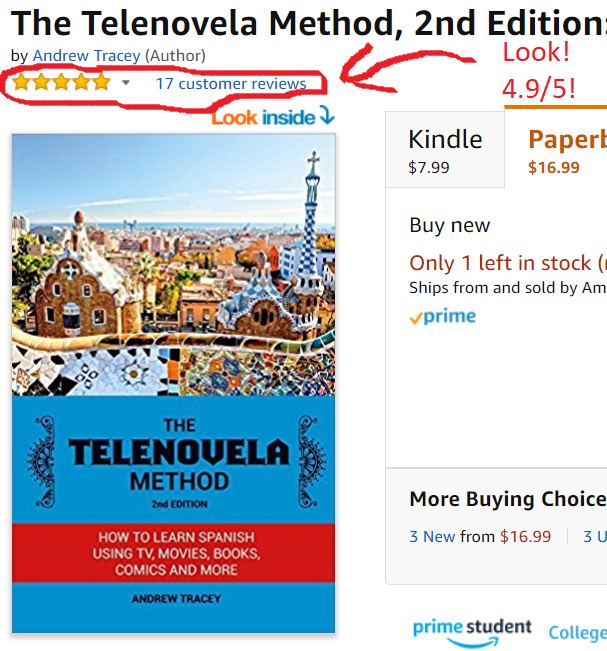 Lastly, it just so happens that I wrote a book about precisely how to learn Spanish, on your own, from the kind of popular media above! It’s called The Telenovela Method and is available on Amazon, Apple iBooks, Barnes & Noble, Kobo, Scribd, and Goodreads (also, your local bookstore should be able to order a copy if you like). The e-book version is about $7.99 and the paperback is about $14.99 (varies a bit by retailer). It’s about how to use popular media of your choice (movies, TV shows, music, books, news, etc.) to learn Spanish on your own. It’s centered almost entirely around online resources, the overwhelming majority of which are free (those that aren’t are very inexpensive and not necessary). I called it The Telenovela Method because the popular media I initially used to learn most of my Spanish about nine years ago was telenovelas (that’s what soap operas are called in Spanish) because they were just about the only thing I could find that, occasionally at least, included subtitles in Spanish. You don’t need to use telenovelas, no, pick what appeals to you. Like I said in the introduction, if you’ve got any additional sites that I missed or any of the above links stop working, please let me know in the comments as this page will be continuously updated to keep it current, also… If you thought the above was at all useful and you want to learn (or are learning) Spanish, please give me a chance and read what I have to say about my book below! Thank you so much for checking out my blog and I hope you’ve enjoyed my writing.